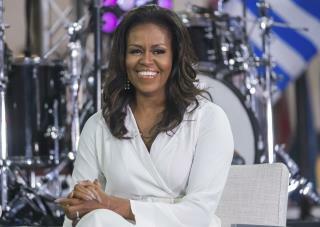 (Newser) – MIchelle Obama's new memoir Becoming looks back at high points in her life, including the "toppling blast of lust, gratitude, fulfillment, wonder" when Barack first kissed her—and low points, including the election of President Trump. In an advance copy seen by the AP, the former first lady writes that she tried to "block it all out" when she realized Trump would succeed her husband. She writes that she thought Trump was merely "grandstanding" when he announced his White House run in 2015, and that she "buzzed with fury" when she heard him boast about grabbing women in the Access Hollywood tape. She says Trump's "birther" campaign years before the election was a bigoted move "deliberately meant to stir up the wingnuts and kooks." How pathetic that she is DEPERATELY trying to stay relevant. And what a surprise - more insults and name-calling from Democrats. I was she and Hillary would grow up.